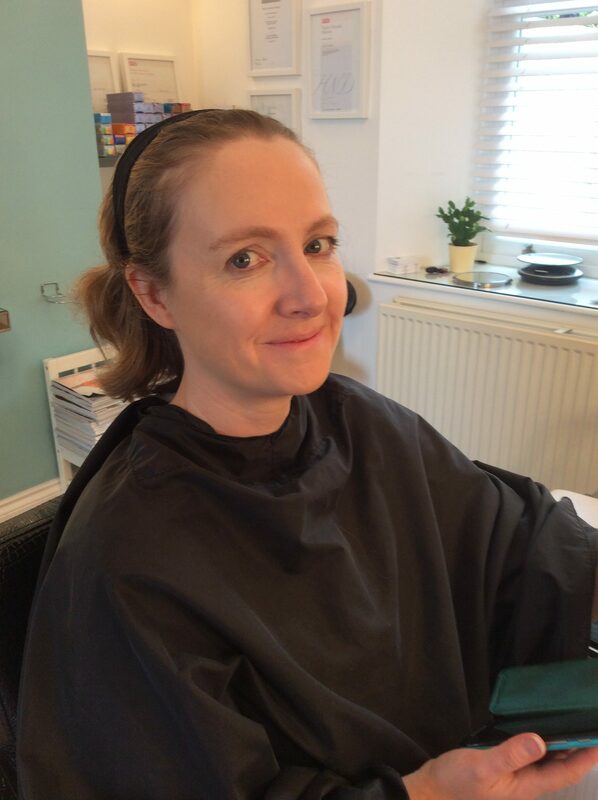 I spent another interesting morning with Maria recently, having a masterclass in evening makeup. As someone who’s never been 100% confident with makeup, I’ve always used a light hand with makeup, and been more inclined to take it off than put more on. So this was definitely a learning curve! 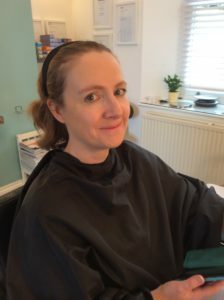 Maria began by explaining that she was going to be working towards Evening Makeup, as distinct from Club Makeup, Catwalk Makeup or Photo-shoot Makeup, for an evening out, or a posh daytime wedding. Bigger and bolder than daytime makeup, but not over-the-top. In the evening, the light is different than during the daytime, either you’re in low light, or artificial light, and that means that your makeup needs to take account of that. The eye finds it harder to distinguish shades, so subtle differences in tone are lost. You can get away with the ‘wrong’ tone of foundation, under artificial light, for instance, which would look odd in daylight. In addition, if you’re going out for a smart event, your clothes are likely to be a degree or two more glamorous than your regular day clothes, therefore you have licence to glam up your makeup as well, to match. Your little black dress, that can be paired with sensible black courts for the office, can go up-scale with glitzy jewellery and heels plus an up-do in the evening, so your makeup can be given more colour, and a bolder scale than you’d maybe get away with at work. 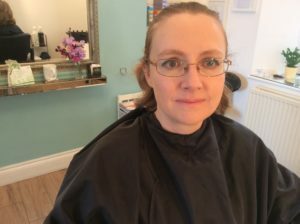 Maria began with my foundation, as she’d seen on a previous visit that I’d reacted badly to one particular product and she wanted to ensure that wasn’t the case this time. With a light oil to soften the skin, and a mineral-based foundation powder from Angel Face (more of that in another blog, but it’s new and exciting!) she built up layers to smooth my skin tone, and give me a natural blush. Looking at my eyes, Maria discussed how an evening look can be tailored to suit the outfit, how for me, the shape of my glasses plays a big factor in deciding what and how to colour around my eyes, and how the normal rules can be bent a little. Normally you wouldn’t use colour outside of the eye socket, but in the evening it’s acceptable to use colour as far as the line drawn from the corner of the nose to the edge of the eyebrow. Of course, rules were made to be broken, but you run the risk of looking over-done if you take it too far! So, how to create a smoky eye? This is a question that is often asked by those who don’t know. And Maria does know, and can also explain as she goes, which is really helpful for a novice like me. 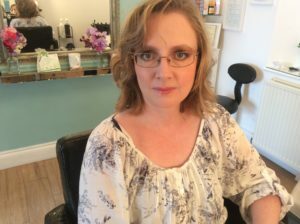 She began with a liquid eyeliner, drawing a very fine line along the edge of the upper lid, followed by a line of eyeshadow, a smoky khaki shade, above it, both extending past the end of the lid and flicking up slightly. Before I’d had time to open my eyes she’d used a clean brush to smudge both the lines together, up around the socket line in a c-shape. Maria used other colours, for me, bronze shades, from the darkest end of the colour palate, for you, maybe other shades. The smudging was different to how I expected. Maria used a makeup artist’s trick, to smudge without scattering powder everywhere. You don’t brush away from where you initially place the colour, but you take the bush and brush IN to the most concentrated colour. The first brushstroke won’t achieve anything, but subsequent strokes will lift a small amount of powder and put it exactly where you want it. You can widen the smudge area a little at a time, around the edges you want it, and leave a firmer line in other places. Once she had lots of dark colour going on, Maria added in a much lighter pink, to give a sheen to the smudge, and brighten the upper lid. She carried on right up to the brow line, lighter towards the nose, and darker on the outside edge. No colour was added on my eyebrows at all, and only a light flick of mascara, to the outer edges of my lashes. 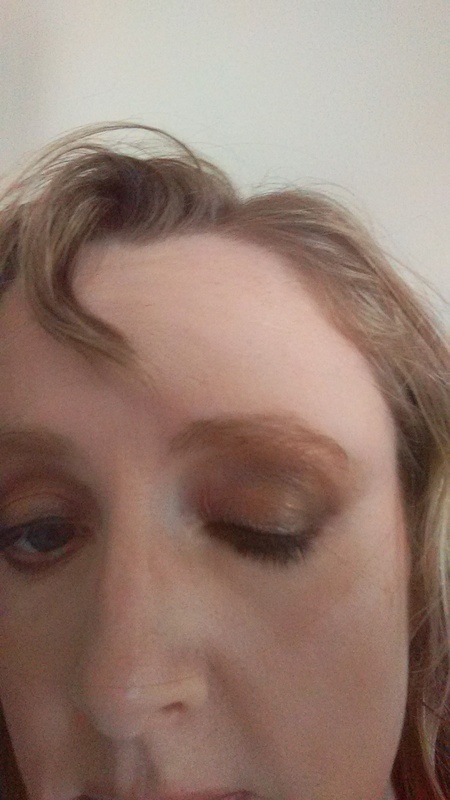 Also, only a very narrow line went in under my eyes, to avoid detracting from the upper lids. At this point, Maria wiped the excess powder from below my eyes, and re-did the foundation, then added some gloss to my lips. Lip colour shouldn’t be too bright, and should be the same shade as the blusher. If your eyes are a highlight, you don’t need stand-out lips as well. So, glamorous evening makeup, without spending hours on it.